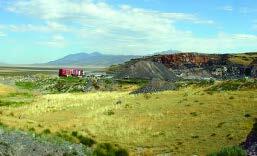 Pit in Mississippian Great Blue Limestone near Tenmile Pass, Tooele County, that produces crushed stone. This pit has also been prospected as a source of limestone for Portland cement production. Question: Why is the paper on which this article is printed a bright white color? Because the wood fiber in the paper is filled and coated with white geologic materials like talc, clay, and limestone — a little known fact. This is only one example of how limestone, a basic constituent of our material world, is underappreciated; limestone is very important to the economies of Utah and the world. Limestone is a common sedimentary rock composed mostly of calcium carbonate. It constitutes about 15% of the earth’s sedimentary rocks by volume. Most limestone formed from the accumulation and cementation of skeletal and shell fragments from plants and animals that lived in shallow waters of oceans and lakes. Calcium carbonate can also precipitate directly in caves, in hot springs, and in hydrothermal veins. An interesting example of direct precipitation of calcium carbonate in Utah is oolite formation in Great Salt Lake. Oolites are the small, egg-shaped, white sand grains that form many of the white sand beaches along the shores of the lake. Limestone’s major industrial uses are as crushed stone, in lime manufacture, and in cement manufacture. Crushed stone is used for a variety of construction purposes like road base and concrete aggregate. In 2003, companies in the United States produced 1.08 billion tons of crushed limestone with a value of $5.46 billion. High-calcium limestone can be heated in kilns and converted to lime (calcium oxide) that is used for metallurgical, environmental, chemical and industrial, and construction purposes. In 2004, U.S. companies produced 18.2 million tons of high-calcium lime worth about $1.3 billion. Cement is limestone that is processed at high temperature with shale, sandstone, and iron. (Cement when mixed with water and crushed rock or sand and gravel becomes concrete.) In 2004, U.S. companies produced 105 million tons of cement worth about $8 billion and the concrete made from the cement was worth about $45 billion. In addition to Special Study 116, information on high-calcium limestone is available from (1) http://minerals.usgs. gov/minerals/, (2) Carr, D.D., senior editor, 1994, Industrial rocks and minerals: Littleton, Society for Mining, Metallurgy, and Exploration, Inc., 6th edition, 1196 p., and (3) Boynton, R.S., 1980, Chemistry and technology of lime and limestone: New York, John Wiley & Sons, Inc., 2nd edition, 579 p.